Handmade leather wallets and accessories. Announcement FatCat Leather specializes in small leather goods, including personalized wallets, holsters, money clips, pouches and cases. Handmade in the USA! HANDMADE: Everything is hand-dyed and/or hand-stitched. PERSONALIZATION is available on most of our items! Each letter, character, or image is individually stamped by hand. There may be some variation in stamping and alignment. We do our very best to stamp evenly. Slight variations add to the unique handmade-ness of the item. PRODUCTION time is approximately 5-7 days. SHIPPING All orders are shipped by US Mail. 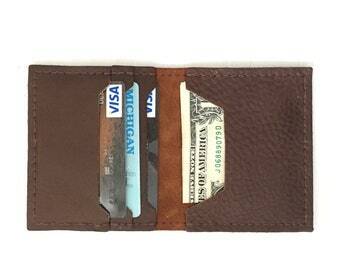 "The wallet I ordered for my husband is perfect! It's well made and solid, sure to last a long time. 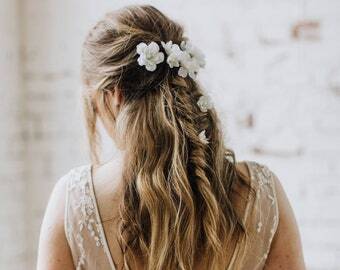 The shop worked with me to get the personalization just right and they were very good about getting back to me quickly (even during the busy month of December)." "Awesome! Bought as a gift and he loves it! very happy with the quality and the heavy duty stitching." FatCat Leather specializes in small leather goods, including personalized wallets, holsters, money clips, pouches and cases. Handmade in the USA! Personalized leather wallets make great gifts! FatCatLeather is run by husband and wife team, Carl and Cathy Meinke. We work out of your home studio in Greenville, Michigan. When we aren't working, we are fishing or golfing (in the summer). 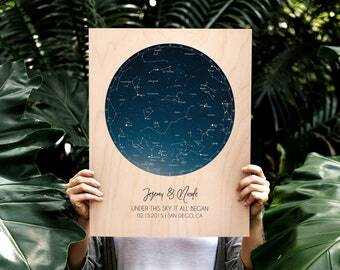 "This was a gift for my boyfriend. He absolutely loved it! High quality. Fast shipment." "Amazing I love the initials! My dad loves it so much! Shipping was super fast. Thank you!" "Very fast shipping, even though I ordered right before Christmas. 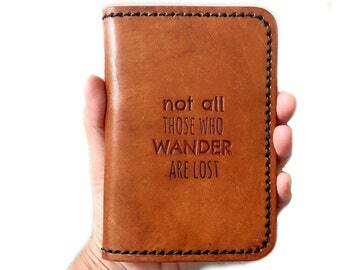 This wallet is incredibly well made, very high quality, but still looks handmade. The imperfect alignment of the initials is perfect for someone who doesn't like to look "too" polished. Thank you!" US SHIPPING: All orders ship by US Mail. INTERNATIONAL BUYERS - Import duties and/or taxes may apply. Buyer is responsible for these fees charged by their home country. If you are unsure of your import allowances and/or responsibilities set by your home country, please take a moment to check this with your country's customs office prior to completing check out. Carl is the main-man behind FatCatLeather. He does all the dyeing of the leather, as well as the stitching. If you need a custom holster, knife sheath, or case, Carl is your man! If you order something with personalization, Cathy stamped it. She has been stamping metal jewelry since 2007, so she's very qualified to stamp leather. She also handles shipping and answers some convos. This is the Fat Cat. Mostly, he oversees all aspects of production, quality control, and shipping. When he's not working, he likes to meow for food, cuddle and snuggle. 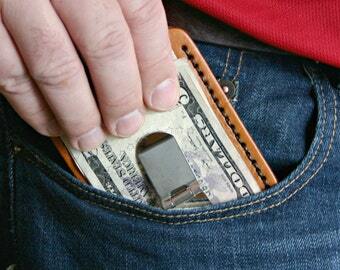 The Flip Clip is a leather card case with a money clip attached. It can be personalized with names, initials, or even short phrases. 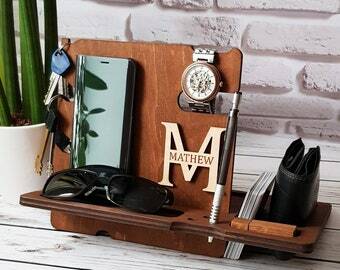 It's a popular gift items for dads, husbands, and brothers.